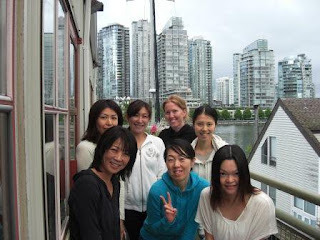 日々のこと: Yoga retreat in Van!! My friend's yoga instructor,Takako and her students have been having a yoga retreat in Van since last Saturday!Retreat in van?? 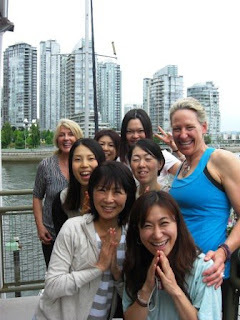 ?Yes!It's a great place to held the retreat for Japanese yogies.We have beautiful nature and great YOGA community here.It's a special place for them,even it's just ordinary for people who live in Van. Taking classes at Semperviva especially Bernie's and Diana's......,to attend the Tiann's restorative workshop,fruits picking at farm,shopping at lululemon,having a picnic and photo shoot at KB..and so on.